Today's readings deal with the theme that God has no favorites and that we must work for Salvation. In the first reading from the Prophet Ezekiel, we are reminded that we are responsible for our lives and how we behave. We cannot blame others for ourselves, especially our bad behavior. Many of us complain saying: "The Lord's way is not fair!" We complain about the many "commandments" that we have to follow which we cite as being restrictive to living life. Atheists often call God immoral for punishing people and for the mere fact that there is a hell. However, God is in fact fair. God is the creator. He made us. We are responsible solely to Him. It would be absurd to think that a parent does not set down rules for children. Moreover, it would be absurd to think that justice and punishment are not connected. Some criticize the idea that a hell exists. How can a merciful loving God have a hell? Well in order for there to be order and justice, there needs to be a hell just like in order for our justice system to work, there needs to be a court and jail system. What good are rules or laws if there are no consequences for breaking them? We have the free will and ability to refrain from breaking the laws. In the responsorial Psalm , we recall how God is merciful. We read how God makes known to us His ways and teaches us the right path. God is our savior. God loves us and never changes this love. The love that God gives is not conditional. God is in fact merciful. He will forgive any sin as long as we are open to accepting His mercy and make the effort to be forgiven. The second reading from the Letter of St. Paul to the Philippians tells us that we must live in love and unity. We must care for one another, not just ourselves. By doing this, we act in Christ. The things we do in life must not be for selfish reasons or to see glorification. They must serve others. Unfortunately, there are sometimes a few of us who trying to scale the "latter of success" in the Church. We may want to be promoted faster, or seek to be honored for things we may have done. This is not what it is supposed to be about. It is about service to God and others. This service allows for personal spiritual growth. Finally, in the Gospel we read of how a man has two sons. To the first, the man tell hims to go and work in the vineyard. The first son says he will not but then does the work. 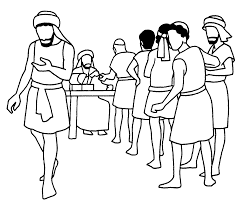 The second son is approached the same way and relies "yes" to the command, but does not go to work. This parable from Jesus reminds us that we cannot become complacent as Catholics. Many times, we feel we are saved just because we are Catholics. There are even some who only go to Mass twice a year whom are often called "A&P Catholics." They feel this is enough to please God and perfect our souls. This is far from the truth. Moreover, we often see at Mass people leave before it is over. Judas did the same thing at the Last Supper. In this parable, Jesus psychoanalyzes the two types of believers: the one who says no but then realizes what is at stake and does the work and the one who says yes immediately, but does no work. Which one are we? Do we say "YES' to the creed on Easter and then do not do the work the rest of the year? Or are we the ones who come to God lazy at first, but then realize that we are offending Him, others and ourselves and then go out and do the work? This is what we must ask ourselves. Nothing is guaranteed in simply calling ourselves "Catholic." We must put that word into action. Catholicism must be living in us and not just something we do on Sunday or even twice a year. Our works do not save us, nor does solely our faith (James 2:14-26). We must incorporate both with the free grace that God gives us. God has no favorites in this regard. Just because we may be Jew or Christian by name, does not guarantee that we will be with God at the end of time or at death. We must earn our keep, so to speak. This can only be done by responding to God's grace with faith and works.